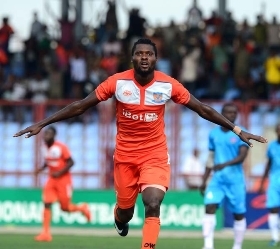 NPFL hotshot and Sunshine Stars' top scorer for the 2016/17 and 2017/18 season Sikiru Adewale Alimi has waved goodbye to the Akure based outfit. Speaking to allnigeriasoccer.com, Alimi Sikiru's intermediary Endurance Iseri Ogbemudia said Alimi was so passionate wearing the colours of the Akure gunners, but the Nigeria Professional Football League side did not value their assets, adding that it would have been easy to extend Alimi's contract with Sunshine Stars but due to personal reasons, the lad has to move. "It was a tough battle, I secured his clearance from the club, despite the frustration the player experienced in hands of those who are supposed to safeguard his budding career, I must commend some members of the Football Intermediaries Association of Nigeria (FIAN) who intervened in some ways during the process of securing the clearance,'' Ogbemudia said. "LMC and other relevant bodies have been notified of the indebtedness, these players suffer so much for football clubs in Nigeria and deserve their wages." ''NPFL clubs can run their affairs without the frequent excuse of no funds from government, I'm ready to offer my services to any club who desire it to end this menace of players indebtedness even with their lean budget, they will be competing with the table toppers," Ogbemudia concluded.